Springsteen and The E Street Band announce first US leg of tour for 17th studio album. Bruce Springsteen and The E Street Band will launch the first leg of their Wrecking Ball tour in Atlanta on March 18, playing East Coast and upper midwest dates through early May before jumping the Atlantic to play Europe with a presumed second US leg aimed for the fall. Among the first dates include stops in Greensboro, NC, a market that while not the biggest on the eastern seaboard has become a favorite for the band. There will be multi-night stands in Philadelphia, New York, and of course New Jersey with stops in Detroit and Cleveland on the docket as well. There are shows slated for Los Angeles and San Jose and that's it for the West Coast on this first leg, thus the anticipation for another US run. The tour will be notable because this will be the first E Street Band tour without saxophonist Clarence Clemons, who passed away last year following a stroke. No announcement has been made by Camp Springsteen as to who might be filling in for the Big Man on sax. Springsteen's official web site listed the E Street Band personnel as Roy Bittan - piano, synthesizer; Nils Lofgren - guitar, vocals; Patti Scialfa - guitar, vocals; Garry Tallent - bass guitar; Stevie Van Zandt - guitar, vocals; and Max Weinberg - drums; with Soozie Tyrell - violin, guitar, vocals and Charlie Giordano - keyboards. Giordana stepped in a few years ago following the passing of Dan Federici. 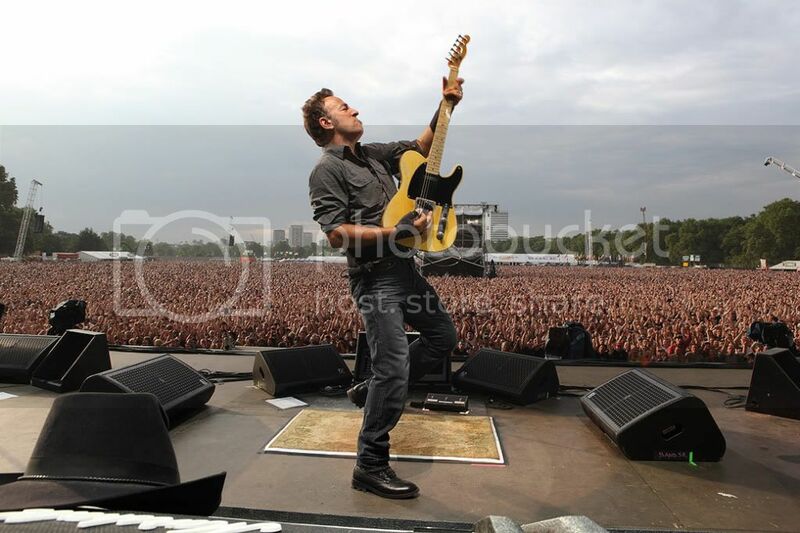 Springsteen released the first single from the upcoming Wrecking Ball last week, "We Take Care Of Our Own." The song has gotten largely positive reviews from critics and the album will be released March 6. The Atlanta kickoff is special for me because it's a mere four hours away from me. I've never seen a tour opener before and I'm seriously considering taking this one in rather than waiting for the second leg. I caught six shows in four states during the Magic and Working On A Dream tours. The band is one of the best live experiences in rock history and I'm eager to capture the spirit of those moments again. I simply don't make enough money or earn enough vacation time for all the great action coming this year. So what say all of you? Are you excited about the tour? Is he coming near you? What do you think of the new single? You can hear it here if you haven't heard it yet. BRUUUUUUUUCE is back, kids. Let's talk about it!